Between June 1976 and May 1980, CVW-8 embarked in USS Nimitz for three Mediterranean deployments. During their third Mediterranean deployment and in response to the Iranian hostage crisis and the Soviet invasion of Afghanistan, the Nimitz / CVW-8 Team left Naples, Italy in January 1980 and sailed around the Cape of Good Hope into the Indian Ocean. Established at "Gonzo Station," the air wing supported the Iranian hostage rescue attempt, Operation Eagle Claw, while remaining at-sea for more than 140 consecutive days. 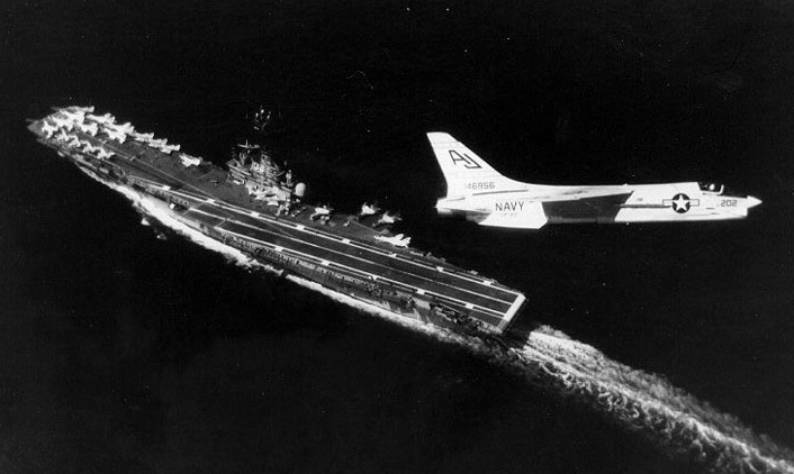 Returning to the United States in May 1980, CVW-8 embarked once again in USS Nimitz for the North Atlantic NATO exercise "Teamwork 80" from August to November 1980. CVW-8 embarked on the Nimitz yet again in April 1981 for Caribbean operations, followed by another Sixth Fleet Mediterranean deployment. 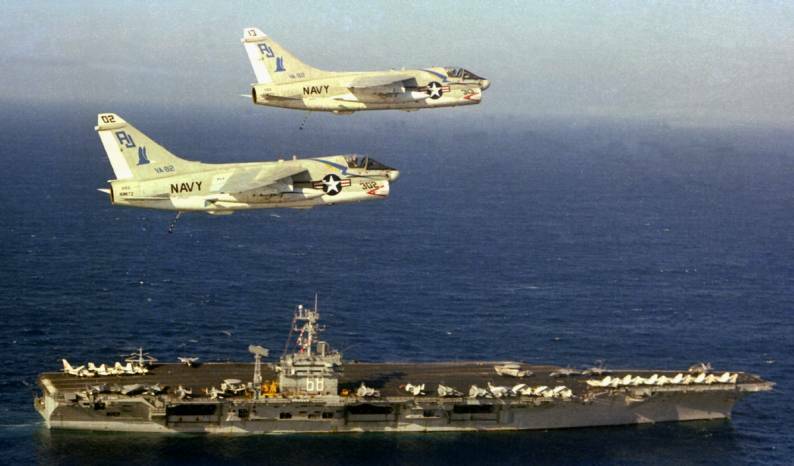 It was during this deployment that two CVW-8 F-14's from Fighter Squadron Four One engaged and destroyed two Libyan SU-22 aircraft following an unprovoked air-to-air missile attack over the international waters of the Gulf of Sidra. Returning to Norfolk, Virginia, CVW-8 embarked in the Navy's newest carrier, USS Carl Vinson for her maiden voyage in March 1982. 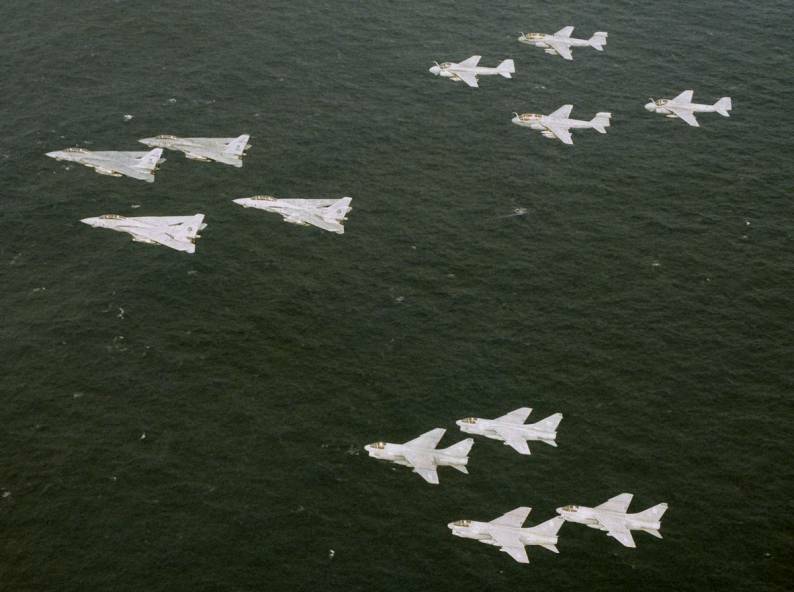 CVW-8 squadrons returned to the Nimitz later in 1982 for Carrier Refresher Training followed by Caribbean operations and an extended Mediterranean deployment from November 1982 to May 1983 which included air operations in support of the multi-national force in Beirut, Lebanon. 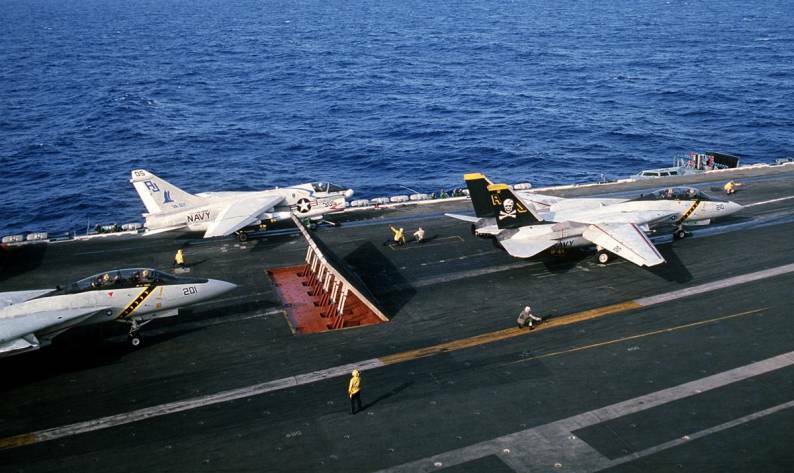 In March 1985, CVW-8 embarked again on the USS Nimitz for a Mediterranean deployment which included participation in several exercises including Distant Hammer, Poop Deck, and Bright Star. 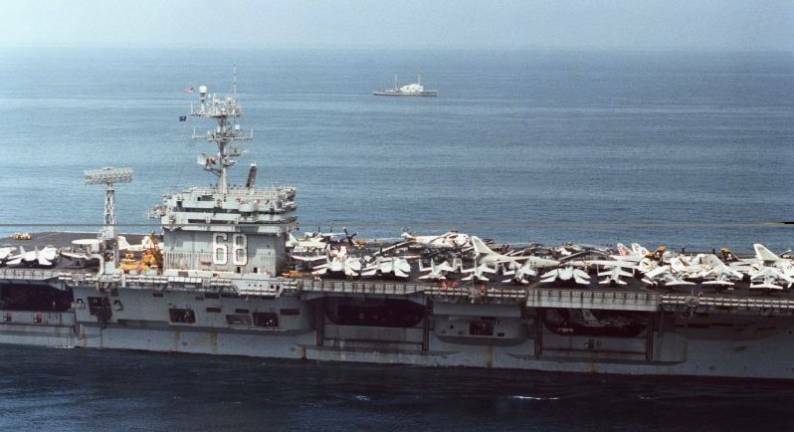 During this deployment, USS Nimitz and CVW-8 were stationed off the coast of Beirut, Lebanon for 69 consecutive days during the terrorist hijacking of a TWA airliner. 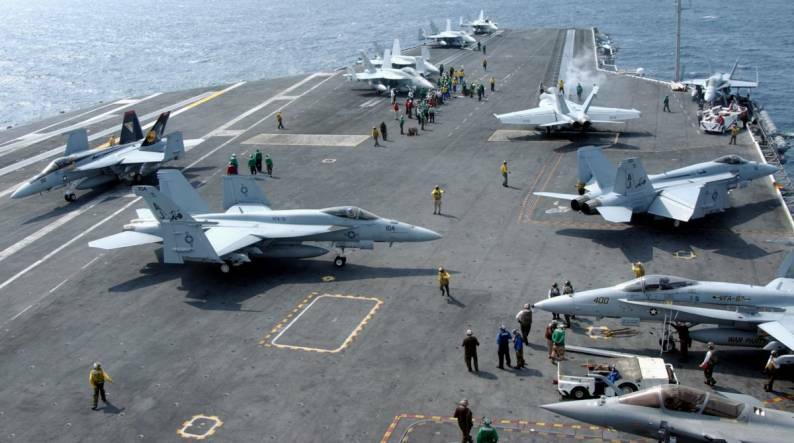 The prompt response and threat of contingency strike operations by the USS Nimitz / CVW-8 team helped coerce the Iranian-backed terrorists into releasing their hostages. 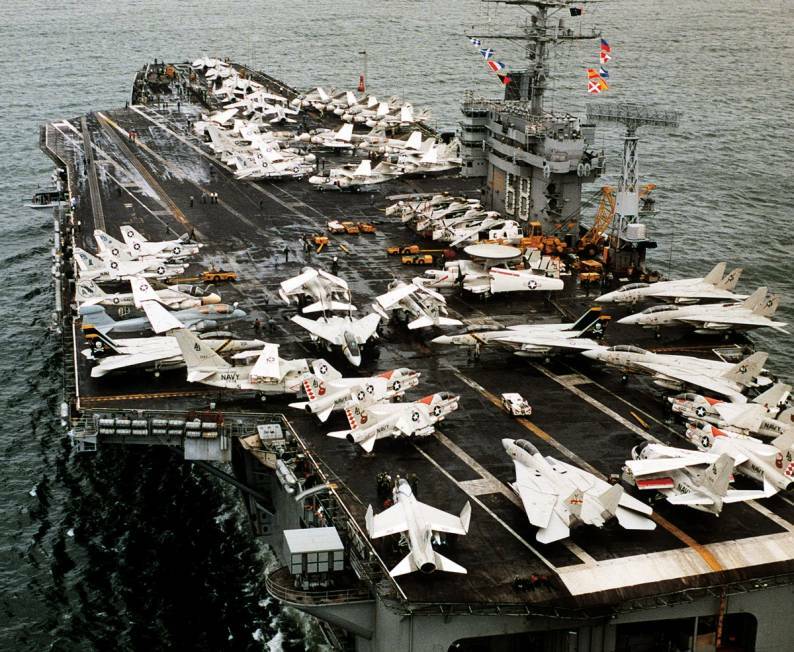 In December 1986, CVW-8 embarked on the USS Nimitz for the last time and deployed to the Mediterranean Sea. 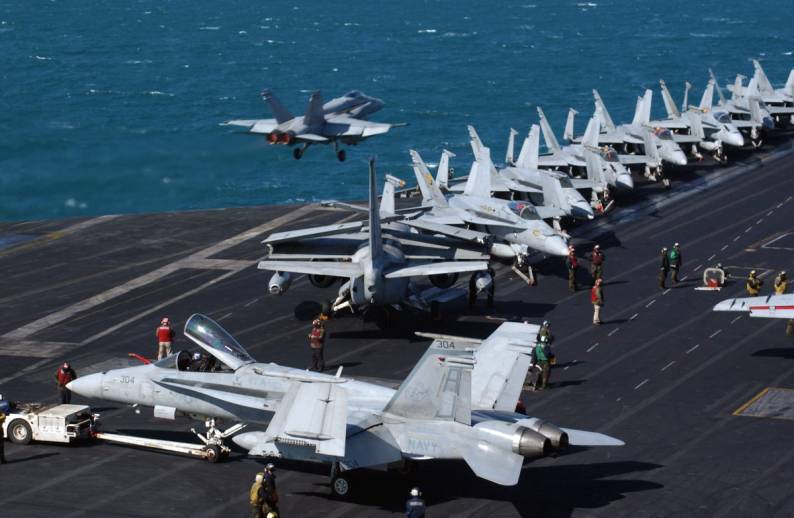 At the end of this deployment the USS Nimitz / CVW-8 team sailed around the tip of South America as the carrier changed its homeport from Norfolk, Virginia to Everett, Washington. 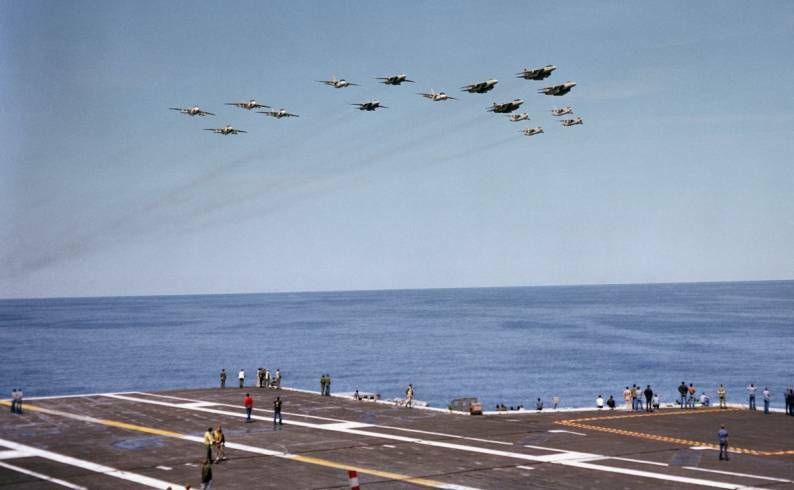 In June 1987, CVW-8 aircraft launched for the last time from USS Nimitz while off the coast of San Diego, California to return to their respective homeports. 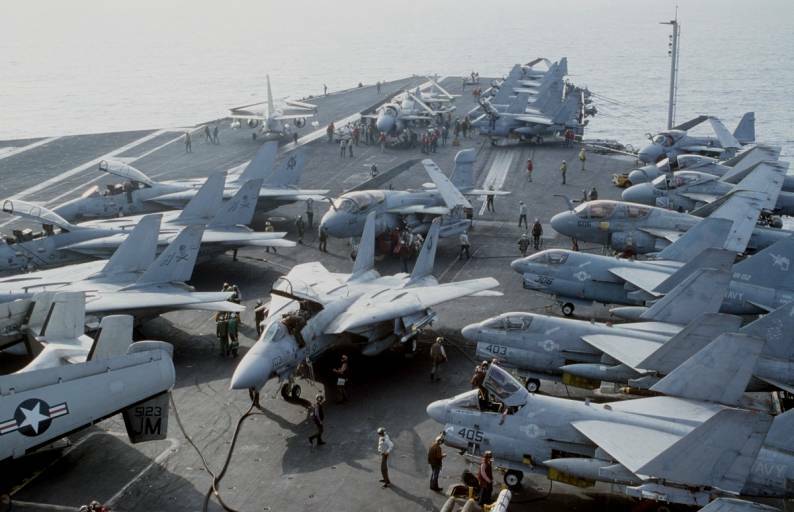 The air wing embarked in USS Theodore Roosevelt in August 1988 for Teamwork 88, the largest multi-national exercise of the decade and operated in the North Atlantic with a port call in Wilhelmshaven, West Germany. In December 1988, CVW-8 embarked the Theodore Roosevelt for a Mediterranean deployment where they participated in 10 NATO exercises. The air wing distinguished itself during this deployment by flying over 22,000 flight hours and 10,000 sorties without a mishap. Following the August 1990 invasion of Kuwait by Iraqi armor and infantry forces, CVW-8 rapidly prepared for possible combat operations. 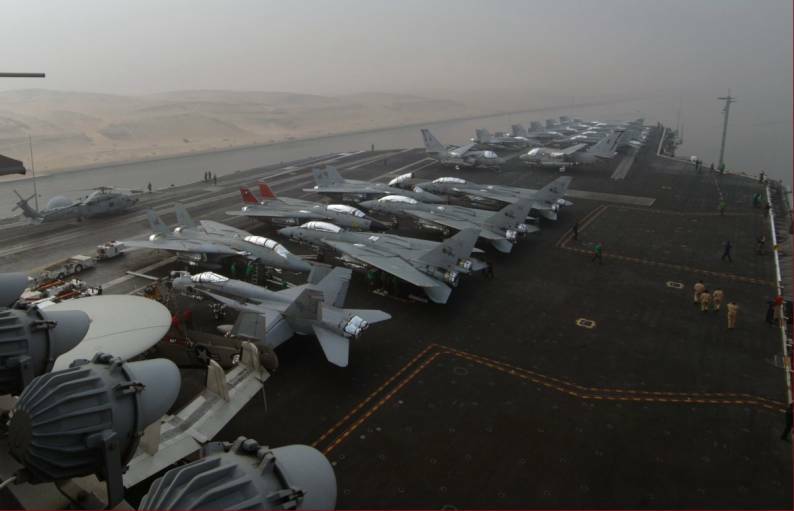 In four short months, intense training enabled the Theodore Roosevelt / CVW-8 team to deploy on 28 December to join five other U.S. Carrier Battle Groups in the largest display of sea power since World War II for Operation Desert Storm. After participating in combat operations in [Iraq in support of Operations Desert Storm and Provide Comfort, CVW-8 returned home on 28 June 1991 for a brief standdown. 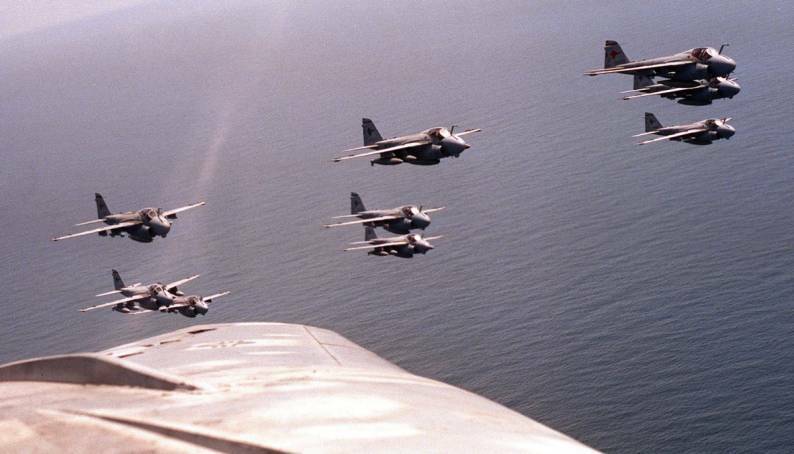 During the winter of 1992, CVW-8 provided opposition forces from Roosevelt Roads, Puerto Rico in support of Carrier Battle Group training. In July 1992, the air wing was the first Air Wing to receive and incorporate a Marine Corps FA-18C squadron, the “Checkerboards” of Marine Fighter Attack Squadron THREE TWELVE (VMFA-312). In December 1992, the USS Theodore Roosevelt / CVW-8 team operated for the very first time in Naval Aviation history as a Special Marine Air / Ground Task Force. 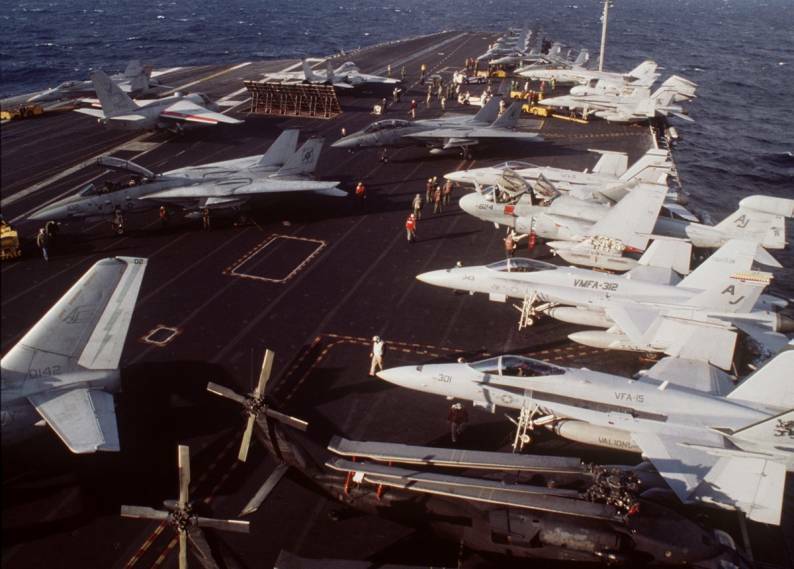 Carrier Air Wing Eight embarked aboard the Theodore Roosevelt in March 1993 and participated in Operation Provide Comfort and Deny Flight in support of NATO sanctions in Bosnia-Herzegovina. In June 1993, the team passed through the Suez canal for Red Sea duty in support of Operation Souther Watch over Iraq. CVW-8 returned to the Adriatic Sea in July 1993 to continue NATO operational tasking until returning to Norfolk, Virginia in September 1993. CVW-8 embarked again aboard the Theodore Roosevelt in March 1995 and operated in the Mediterranean Sea, North Red Sea, Persian Gulf and Adriatic Sea. CVW-8 responded to threats from Iraq by conducting joint operations with the Royal Jordanian Air Force and also enforced No-Fly Zones over Bosnia-Herzegovina as part of Operation Deny Flight. On 29 August 1995, CVW-8 commenced air-to-ground offensive operations in Bosnia-Herzegovina during Operation Deliberate Force to include the first ever Navy combat use of the GBU-24 2,000 pound laser-guided penetrator bomb and the first combat use of the F-14 “Tomcat” to deliver air-to-ground ordnance. 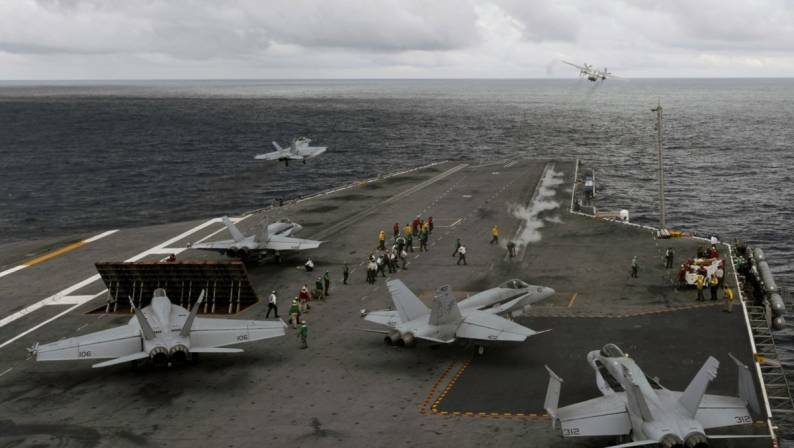 The USS Theodore Roosevelt / CVW-8 team returned home on 22 September 1995 and on 1 November 1995, CVW-8 was reassigned under the operational control of the Kennedy Battle Group, forming the team of USS John F. Kennedy and CVW-8. 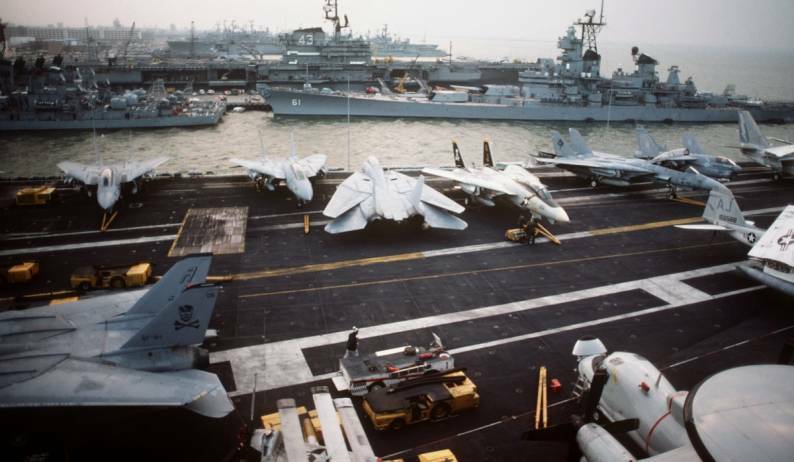 The air wing embarked in USS John C. Stennis in February 1996, for a Joint Fleet Exercise. This was followed by deployed operations to the North Atlantic while embarked in USS John F. Kennedy with port calls to Dublin, Ireland and Portsmouth, England. In April 1997, CVW-8 embarked in USS John F. Kennedy for a Mediterranean Sea / Persian Gulf deployment. During this deployment, CVW-8 participated in numerous exercises and detachments including Infinite Acclaim, Beacon Flash and Invitex. 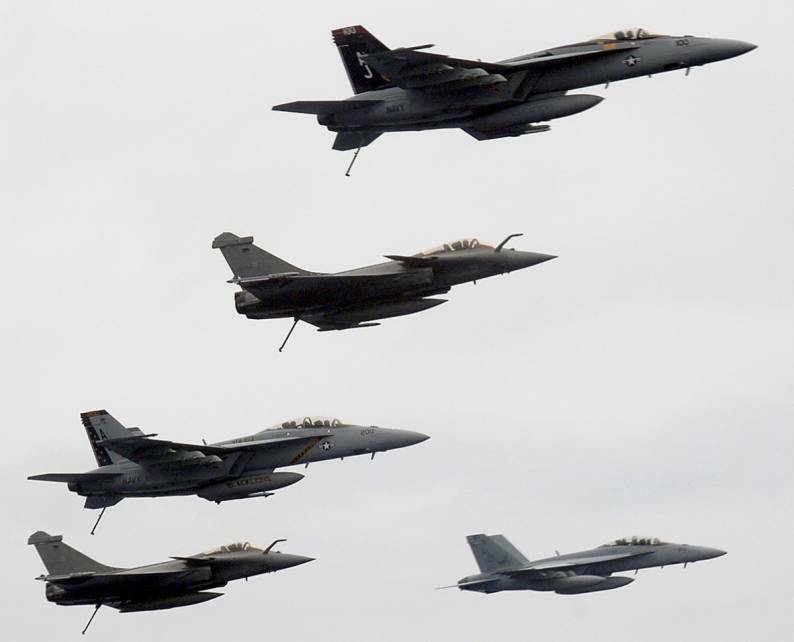 During Invitex the Air Wing completed over 350 sorties including 203 sorties in a single day of surge operations. 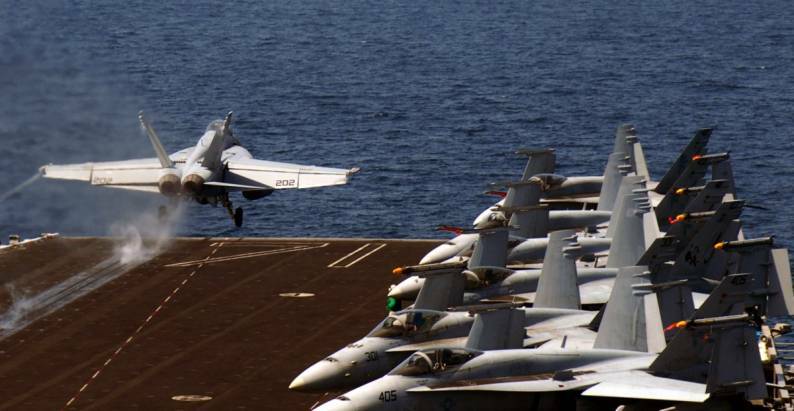 This deployment also included operations over Bosnia-Herzegovina in support of Operation Deliberate Guard and over Iraq in support of Operation Southern Watch. 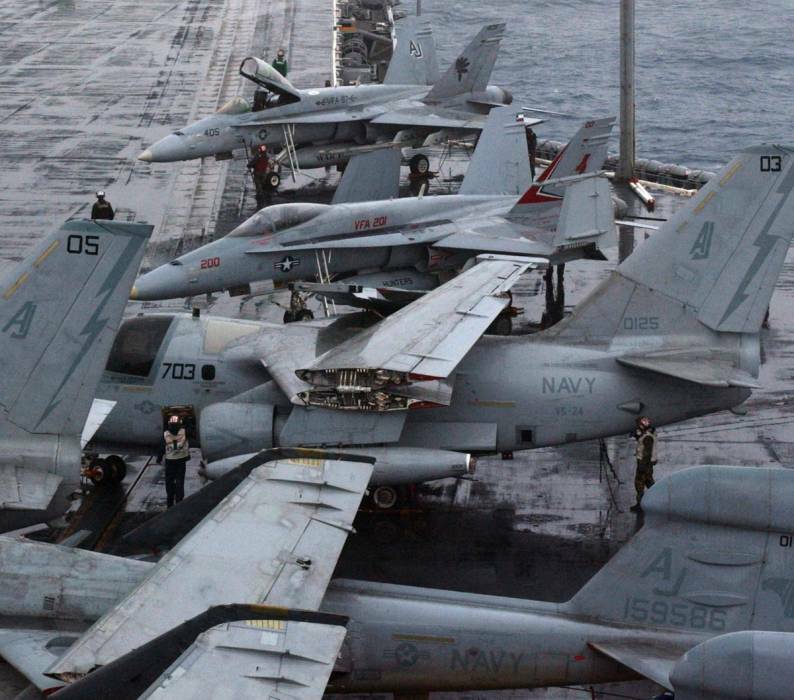 In January 1999 CVW-8 deployed on USS Theodore Roosevelt and participated in Operation Allied Force during 55 consecutive days of combat, flying 4,300 sorties, logging 10,000 flight hours and dropped 800 tons of ordnance. 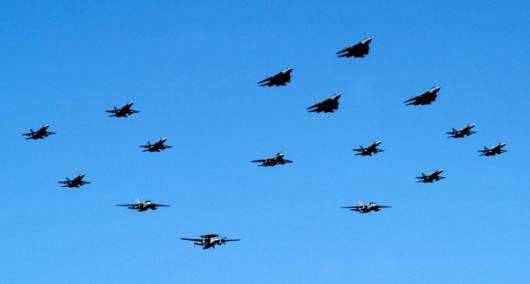 The Air Wing came up with new tactics utilizing cooperative targeting between F-14s and F/A-18s. 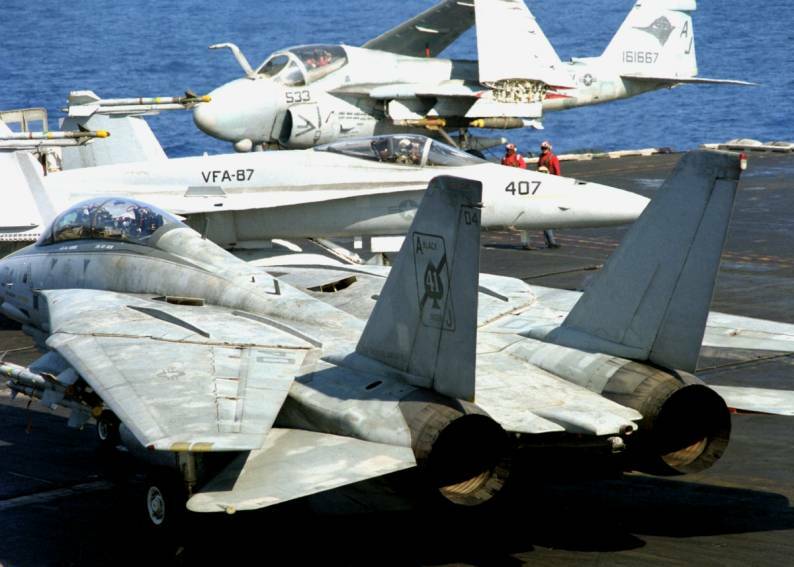 CVW-8 was also the first Air Wing to expend weapons in two theaters as they headed for the Persian Gulf to support Operation Southern Watch after the war in the Balkans had ended. They flew over 2,600 missions over Iraq. 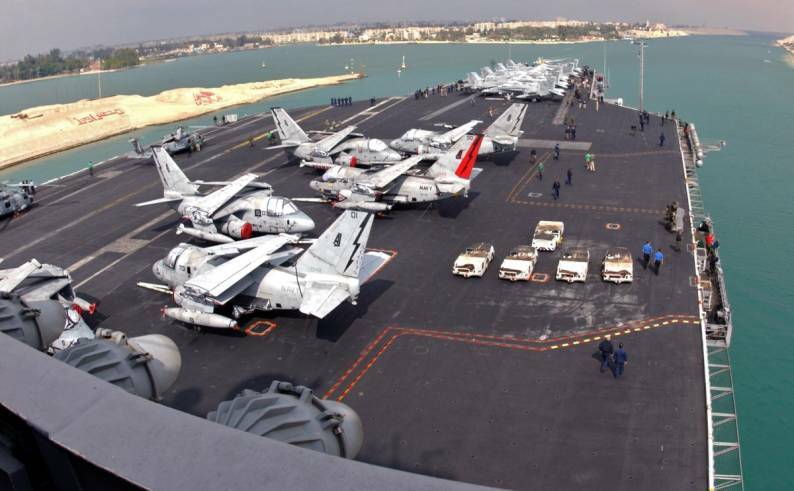 In 2001, CVW-8 embarked aboard the USS Enterprise and completed a six and one half month deployment culminating in the initial strikes of Operation Enduring Freedom in Afghanistan. The deployment began with detachments in Tunisia, Corsica, and Israel, as well as half-dozen port-visits throughout the Mediterranean. During the second half of the deployment, the Air Wing flew in support of Operation Southern Watch expending over 29,000 lb of ordnance against Iraqi targets. 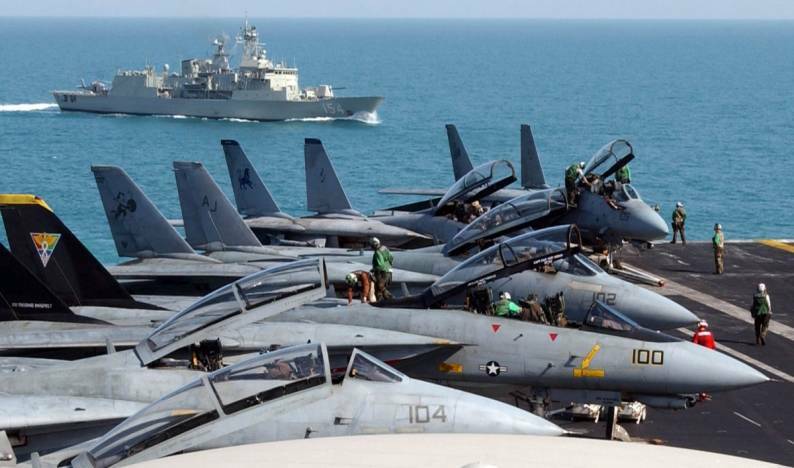 The USS Enterprise / CVW-8 team were wrapping up operations in the Fifth Fleet area of operations on 11 September 2001, remained on station and eventually flew 16 days of combat operations over Afghanistan to include 680 sorties that delivered over 770,000 lb of precision guided munitions during the initial stages of Operation Enduring Freedom. 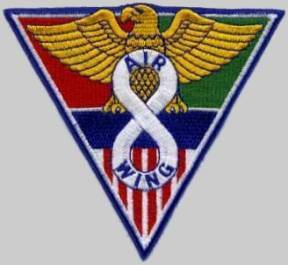 On 19 February 2002, the Air Wing was reassigned back to the Roosevelt Battle Group. 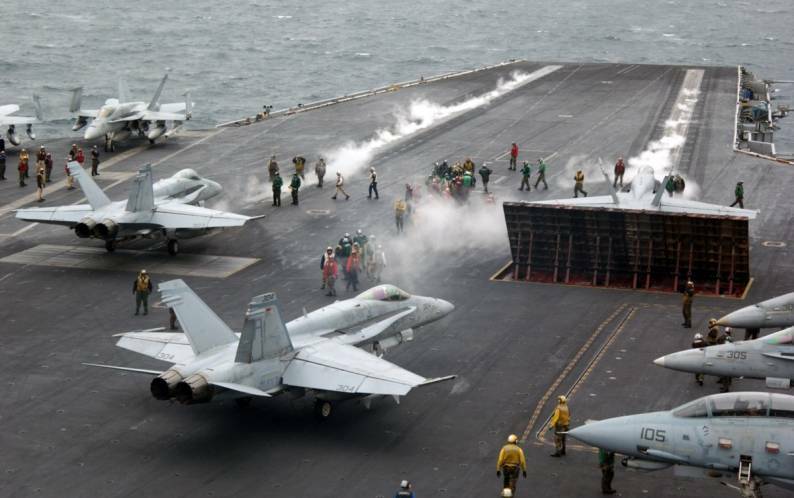 CVW-8 made some changes as VF-14 and VF-41 had begun transitioning to the F/A-18 Super Hornet and moved to CVW-11, VF-213 (formerly CVW-11) became part of CVW-8 instead. 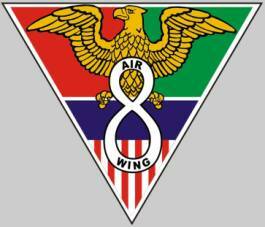 In July 2002, CVW-8 began accelerated work-up operations leading to a combat deployment in support of Operation Iraqi Freedom. 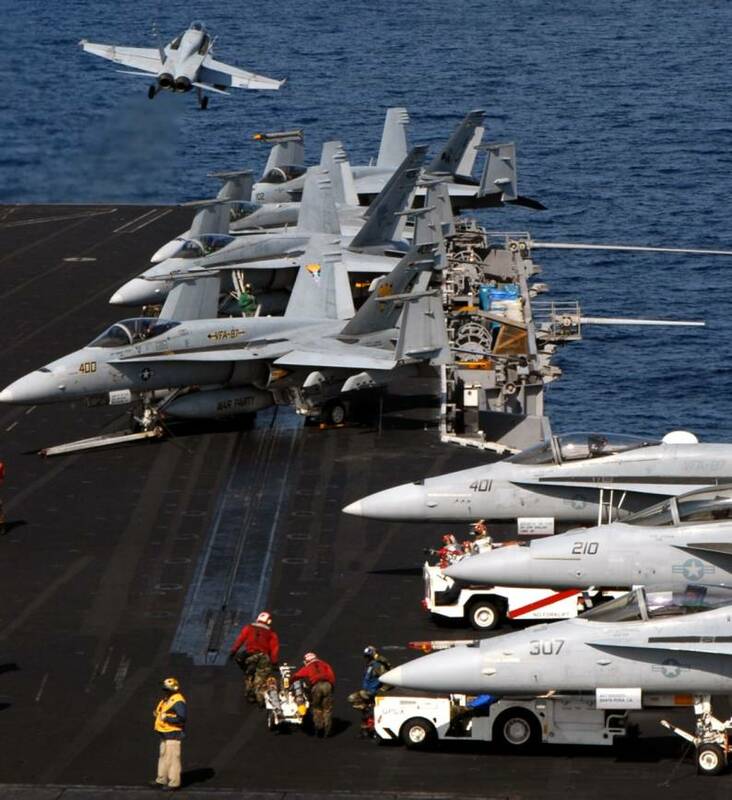 In October 2002 CVW-8 integrated Strike Fighter Squadron Two Hundred One (VFA-201), a reserve Navy FA-18A+ squadron, and embarked in USS Theodore Roosevelt in January 2002 for Caribbean training operations. The Theodore Roosevelt / CVW-8 team deployed to the Mediterranean Sea in March, at the conclusion of Caribbean training operations, and participated in combat operations in support of Operation Iraqi Freedom flying over 1,000 sorties and 5,000 hours that delivered over 1,000,000 pounds of precision-guided weapons. 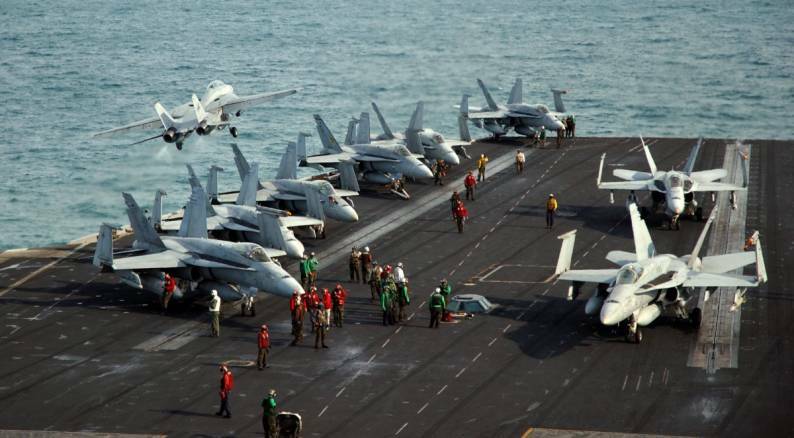 The USS Theodore Roosevelt / CVW-8 team returned from deployment in May 2003 and was chosen as the test platform for the Chief of Naval Operations Fleet Response Plan initiative. In 2005, CVW-8 became the last carrier air wing to deploy with the F-14 Tomcat when it departed for the Persian Gulf with VF-31 and VF-213. Captain William Sizemore, Commander Carrier Air Wing Eight, landed the last F-14D Tomcat to participate in a combat mission when the last OIF line period concluded in February 2006. CVW-8 flew 16,000 sorties, logged 38,980 flight hours with a 97.3% sortie completion rate and dropped 61,000 pounds of ordnance. 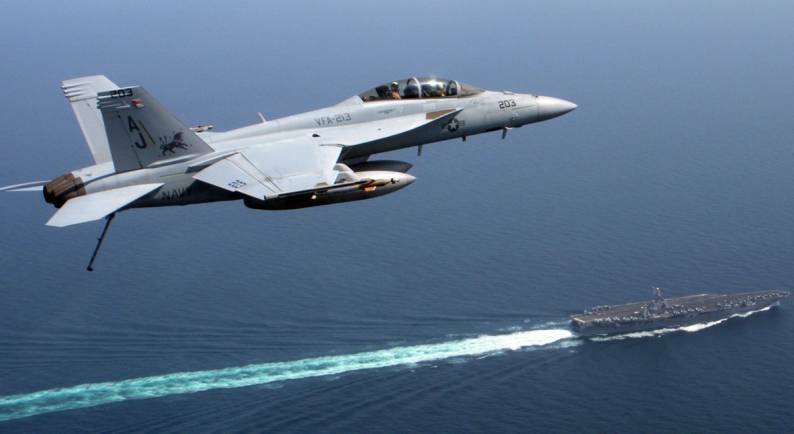 CVW-8 and Theodore Roosevelt participated in Joint Task Force Exercise 08-4 Operation Brimstone off the coast of North Carolina between 21 and 31 July 2008. The British carrier HMS Ark Royal, the amphibious assault ship Iwo Jima with associated units and the Brazilian Navy frigate Greenhalgh (F-46) and the French submarine Améthyste also participated in the event. 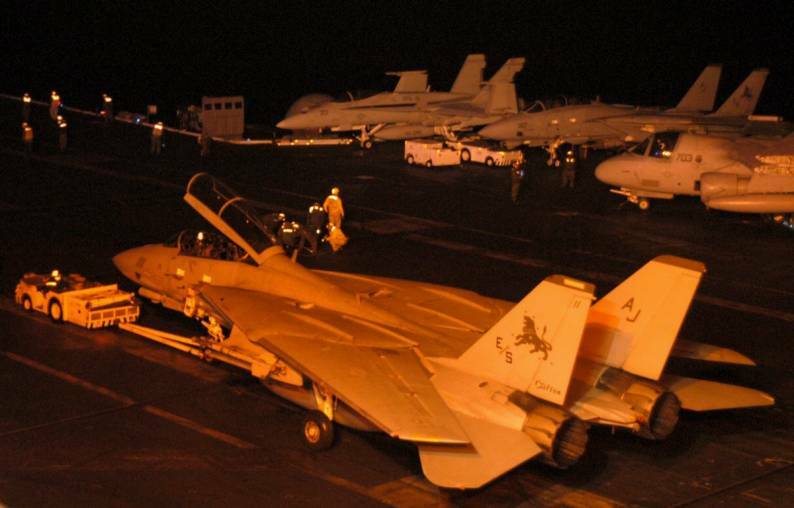 On 8 September 2008, CVW-8 deployed onboard the USS Theodore Roosevelt on a regularly-scheduled deployment. On 4 October, the Roosevelt Carrier Group arrived in Cape Town, South Africa, the first visit by an American aircraft carrier since 1967 and three days later the carrier left Cape Town. 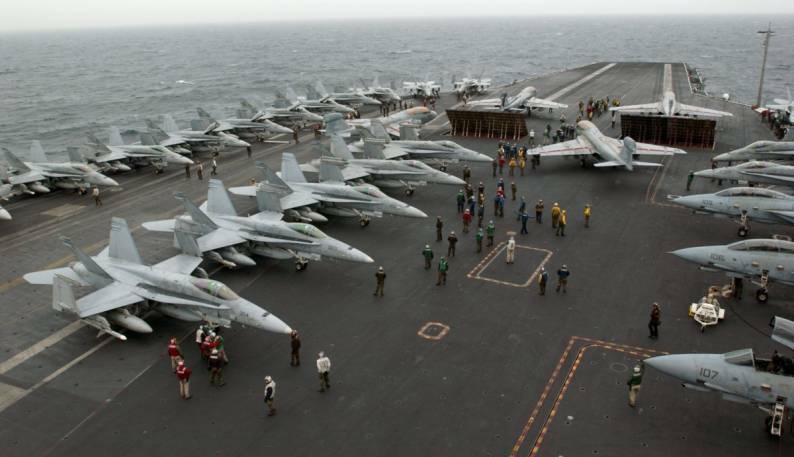 CVW-8 and CVN-71 supported Operation Enduring Freedom and flew more than 3,100 sorties and dropped more than 59,500 pounds of ordnance while providing Close Air Support for ISAF-forces in Afghanistan. 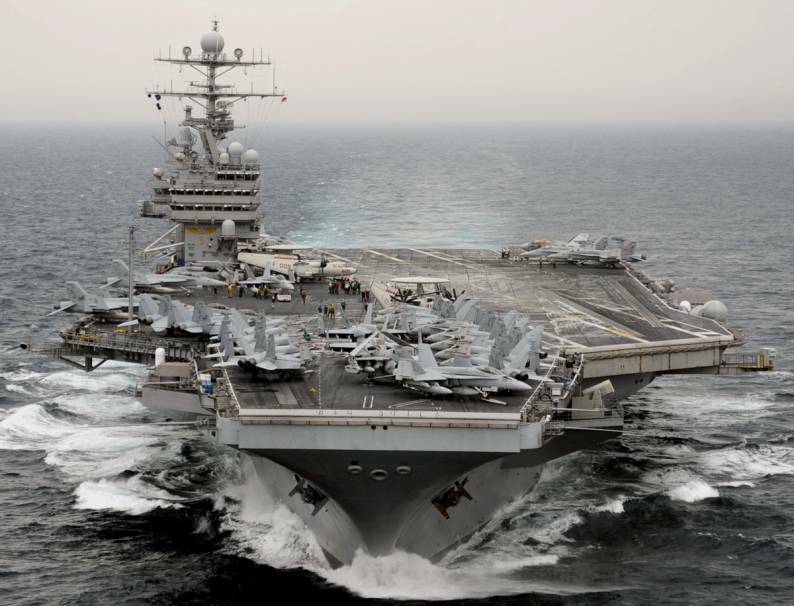 On 21 March 2009 Theodore Roosevelt was relieved by USS Dwight D. Eisenhower (CVN-69). 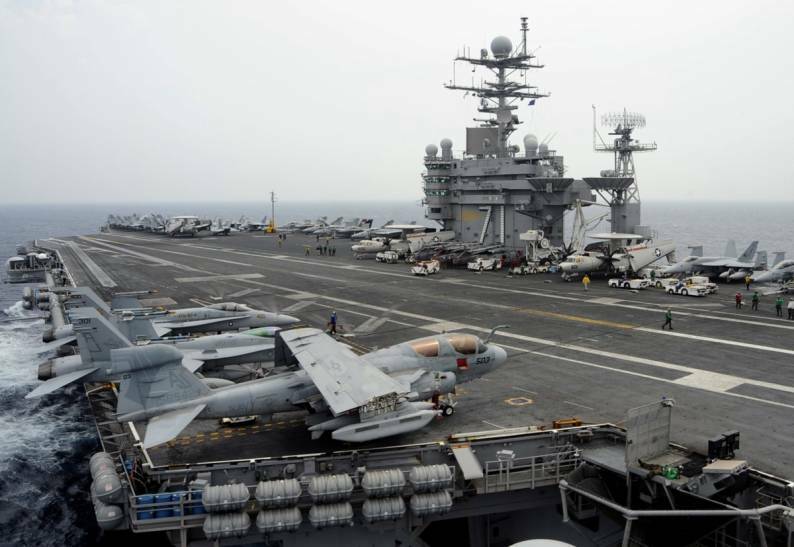 On 29 August 2009 Theodore Roosevelt entered Northrop Grumman Shipbuilding at Newport News, Virginia (USA), to begin a Refueling and Complex Overhaul (RCOH) which is scheduled to last until February 2013. CVW-8 will be assigned to USS George H.W. 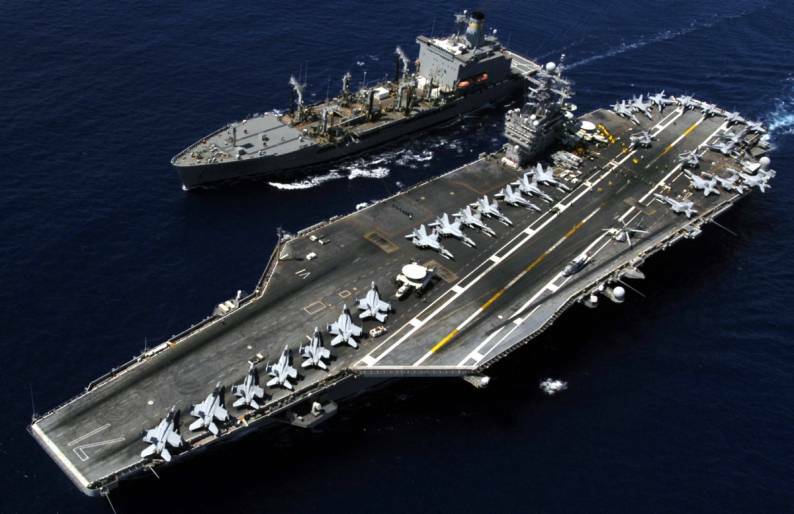 Bush (CVN-77), which is expected to begin her first deployment in 2010.